Could spend 9000 gems, but for 10,000 can get 5 random legendary. Thoughts? Get a higher paying job or ignore this event. If it's a Elite rune (player level 70 or higher required) then you could buy 3k stamina for 4800 gems and use all free stamina (340/day) of the remaining days to reach 100k tickets. But you will need about 800 to 1000 loot keys, too. If you have time to run dungeons manually then you will get some stamina back from sparkling objects. It's a custom Elite rune (4th stat can be: Enabler, Shield-piercing, Unbreakable Heart, Taunt or Festive). It has its costs. But compare it to Elite event runes. They are sold for 7500 gems. When you craft Elite runes you need at least 3500 gems and a lot of mats for a random 4th stat. So help me out here please. 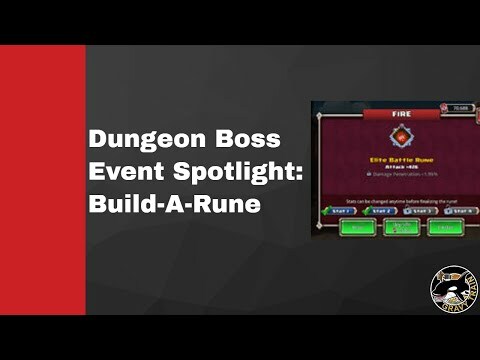 If I wanted to build an elite rune with taunt as the extra ability exactly what's the total cost and exactly which choices do I need to make? stat 4 costs 100k tickets or 9000 gems. for a 5* legendary Elite rune with a special 4th stat. Is it expensive? Yes. But there are no better runes in the game. You need to complete all quests and use all free stamina for a week to get enough tickets. You need loot keys. Probably need to spend some aether or gems, too. Alternatively, you can craft a 5* legendary Elite rune with 3 stats for just 70k tickets. Quests pay out over 80k if I am not wrong. I think it's not a bad deal since Elite runes costs 3500 gems plus materials when you craft them. And crafted runes will get a common, random 4th stat, no taunt, no enabler, etc. There is also an individual leaderboard with thresholds for tickets. The thresholds are imho very high but they start also very low. You will get some rare tokens for tickets, too. Thank you. Do I choose defense each time when choosing stats? Also you say tickets or gems. I have gems. How do I change those to tickets? I'm not finding any thing in the shops, or do you mean buying stamina and grinding? Yes, there is an offer in the shop: 1000 stamina for 1600 gems. Then quick loot or grind dungeons, and complete quests. Do raids pay out tickets, too? Thanks for the responses. That’s very helpful. What is the best 4th stat? I spent my first couple of days tickets on portal pulls. Now that I find out I might have been able to afford an elite rune with 4th stat had I understood the costs in the beginning, its either no longer possible or not worth it. I'm going to complete my dailies and quests, buy some pulls or keys in the shop, and move on to another game that I can advance in that costs less and provides more upfront information. What's the point of "having the best in the game" for a short time when it costs so much time and energy (and money?) That's not fun, its a form of self-inflicted punishment.